Are there too many EU member-states? Today, 27 European foreign ministers are meeting in Brussels to discuss joint EU foreign policy. It’s a packed agenda, with the EU’s response to the conflict in Syria up for debate (a topic we looked at last week here), along with (amongst other events of global import) the recent elections in Libya; the new Muslim Brotherhood government in Egypt; the tense state of affairs between Sudan and its independent neighbour, South Sudan, and the ongoing conflict between Islamists, Tuareg rebels and the government in Mali. With 27 talking heads (soon 28) plus the various circles-within-circles of the European Commission, European Parliament et al forming more circles of hell than Dante ever envisioned, [EU foreign policy is] an exceptionally poor common denominator that does not offend any Member State or create specific difficulties for a particular member. How, in fact, can the EU even have a position on Kosovo when so many Member States don’t and won’t recognise it? You can read a policy-briefing on the EU’s role in Myanmar from our partner think-tank, Friends of Europe, here. What about the example of Kosovo, brought up by Nikolai? Is it really possible to say that the EU has a “common” foreign policy on Kosovo when some member-states recognise it and others refuse to do so? What do YOU think? Is it still possible to reach agreement in an EU of 27 member-states on issues such as foreign policy and the response to the Eurozone crisis? Does EU foreign policy lead to the “lowest common denominator”? Or do the common decisions that are taken pack a bigger punch because they represent the will of all 27 EU members? Let us know your thoughts and comments in the form below, and we’ll take them to policy-makers and experts for their reactions. no too many but I think they need same condition to do business, salary, the iva from salary and all this…everybody is living from slovakia because the world is better…now in spain is all the same.. Unfortunately, I guess it’s like that. I do not personally believe it’s a matter of the number of States involved, but the different ideologies, points of view and commitment to a common future. Some years ago it would have been much easier to do, because it’s easier to draw a common policy between countries that are more culturally related. Wouldn’t be crazy to think about common policies for France, Italy and Germany…but I guess a common policy between UK and Bulgaria or Romania is quite a different story. Yes, there are far too many members. The British have pushed their own enlargement agenda successfully so far keeping themselves on the EU outskirts. More members less centralized authority. Easy for Albion to jeopardize the EU foreign policy while orchestrating their own symphonically with the USA. That’s why the EU foreign and fiscal policy has been so far extremely cacophonous. Is it still possible to reach agreement in an EU of 27 member-states on issues such as foreign policy and the response to the Eurozone crisis? How could it be that ending it would not in effect end the European project itself and wreak havoc. But without integral acknowledgment, the EU will not survive and will fall apart. Dragging the whole world after it. The decisive point is not concerning the question of ?is it possible or not,? but rather ?will there be peace or otherwise”. Europe could move forward to real economic and political integration. For that, the EU has to continue business as usual, but to add, on all levels, the movement for inner unity and mutual participation. Only the inner bond among people, canceling the boundaries between each and every citizen of the European Union can lead Europe to full bloom. It is amazing how much money was invested in advertising the unification of Europe, and how little care was taken to draw awareness to Europeans about the spirit of integration! The only solution now is to establish a close relationship and comprehensive program for merging the EU into one whole. I am afraid that will happen. The focus is on economy and on that only! The people of Europe are not asked nor will they ever be. Already we have the “central” European States that run the show and all the others that want to have their piece of the cake. We see what happens in Greece that belongs to the “old Europe” The wealthy take their money out and the ordinary people have to take the blame! There will be problems that is for sure! As soon as the social balance is out of control the demaonstrations will turn into riots and the rest can be looked up in history books! Politicians never learn! Mona Al: Your proposal sounds as tempting as it is frightening and virtually unachievable. Inner unity? Inner bond between nations? Bond based on what? Do You honestly believe that nations like Spain and Germany have so much in common that their citizens may be paired in Bluetooth fashion? This is the main problem of whole European Utopia project, in theory it may sound good but we live in reality, which doesn�t always unfold as expected. As my comments seems to be the basis of this article, then naturally I stick to my points made. To reach why I conclude the EU foreign policy (like most EU policy to be honest) runs at the lowest common denominator level should be fairly obvious. There can be no common EU foreign policy without consensus between all member states. Thus we have to ask ourselves who in fact, sets EU foreign policy (or any other EU policy for that matter). As far as I can see, regardless of how it is supposed to work, the most powerful body in the EU machinery is the European Council made up of democratically elected national politicians representing national interests. The next most powerful EU institution in the current climate is the ECB with is doing a fairly good job of trying to remain independent. Then possibly comes the European Commission which may put a few ideas on the table and hope to convince the European Council to agree a common position (normally the lowest possible denominator to satisfy all concerned with the words and actions used). Then the European Court of Justice who are generally ignored by sovereign nations if they want to. Then the European Parliament has its say on what it is given to debate and may be allowed to scupper the occasional deal that the European Council don’t really care about that much one way or another. So who forms EU foreign policy? Not the European Commission and not the EEAS as they work only within the scope that the sovereign members through the European Council will allow. And here we arrive at my lowest common denominator as far as EU foreign policy is concerned. Does the EU via the Commission accept the lowest common denominator as agreed by the European Council and then try to work with it through the EEAS, or does it try to forge a common position with real substance only to see it very often reduced to the lowest common denominator to get European Council approval. Will the addition of new members make this more difficult? Statistically you would have to say it does, however in reality there are only so many positions that can be taken over any issue by sovereigns and thus, no, it probably won’t make it any harder to get a consensus that remains the lowest possible denominator. There can not be too many states in any union, even it shall some day be a union of all states in this world. That’s the system of uniting these states that does not work right now, as there should be no specific states interests, but common European ones. We sould not sacrifice the beautiful idea of united and strong Europe to the greedy and unlawful interests of senior managers of the banking sector: banks should be either regulated (it is arguable which means may be used); otherwise, if we’d like to have a deregulated capitalism, then banks must go bankrupt when they fail, like any other business. That would be fair: governments do not save small businesses – why should fatty bankers be? No…As long as there are some European countries outside the EU, there can never be too many states… For me, all European countries should sit around the same table and shape the future of this continent..From the richest like Norway and Switzerland, to the poorest, like Moldova and Albania. For me it is not about money, power and prestige, rather shaping the future of our continent together, with cooperation. Now if you want a better functioning EU, then you must better the tools and bodies that help us govern it.. Stream line it, give full power to the EP in matters of Europe… That will solve the democratic deficit and help Europe to speak with one voice… And all members should follow the EU laws that come from the EP, not opt-out! Yes, there are too many countries and as a supporter of political union of Europe is a fact that I do not like. Instead of constantly questioning and having cold feet, just get on with the project Europe!!! All treaties are there, the parliament is democratically elected, so give them the power to make a “UNITED EUROPE” work. By opening Europe up too quickly you have impovershed us all. This has made it impossible to fund the troubled States who are fiscally unfit for this union. And were at the beginning of their application and which you chose to deny. There financial status was hidden by Goldman Sachs, and the tax payers of Europe, as well as the Greek people, are having to pay the price for the duplicity of the US government, with their deceitful practices. As you know it began with Fanny Mae and Freddie Mac. Which spread like a cancer through the banking world to Europe. This is a four part story. Here is the first part. Listen to what they are telling you. And you will realise we have been robbed by those who took the money and stashed it off shore, in tax free zones. Where it remains. And don’t forget the governments colluded in it all. The bankers took bad debt and packaged it with good debt. They invented financial instruments that hid the debt from the eyes of us all. And then, gambled with it to the point of bankrupting us all, except themselves. Governments then bailed them out by telling us they couldn’t allow the banks to collapse. it was their own wealth they were protecting when they did that. And now millions are starving. On top of this, the US sabotaged the Euro to protect the dollar. It was sabotage. Therefore, why would you want to get back into bed with a wife beater? If you have been beaten to within a breath of your life, why would you want to go back for a second round? Only a simpleton does that. 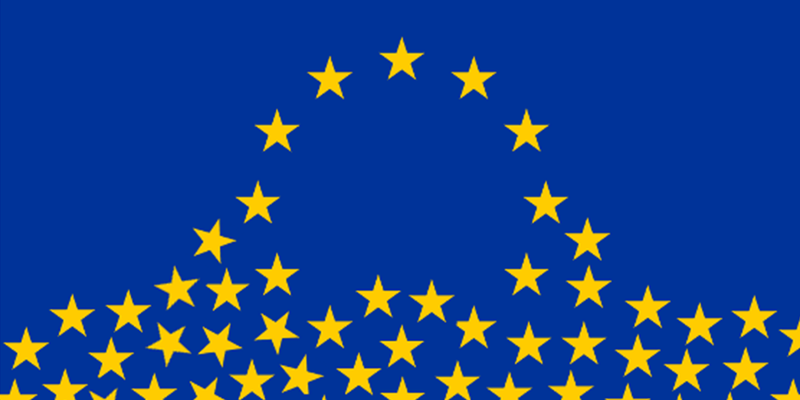 I think that there is great number of members of the European Union and can still expand, but the expanding in 2001 was to many, to take into the union. Because some member states didn’t live up to some of the rules, and the democracies in many of the ealier USSR nation, are still very young, and should maybe tried to devolped in some time before they entered the EU. But I believe in the EU, so it is just hard work, and it will succed. What’s too many? I believe that every European state has the right to become an EU-member, even Turkey. As long as countries meet the requirements of the membership, the’re welcome. But, some countries are granted membership too fast in the past. Therefore the differences within the Union are maybe too big at the moment. The ultimate European dream, becoming a federal republic, is maybe too ambitious at the moment. Just look at America. The Union over there didn’t start with 50 states. In the period 1800 – 1850 the Union exploded and state after state joined. In a short period of time the differences within the Union became too big to overcome. The disastrous outcome: Civil War. Hopefully Europe learns from that American lesson. Starting with a small core of states with a lot of common interests is the way to go. A federal republic should be formed by the memberstates that are already bonded together: the ones in the eurozone (eventually without Greece). Once the other EU-members are really ready for it, they’re welcome to join the federal republic, but again: not too many, too fast. Greece is not the only or even the main problem of EU, especially after the big expansion of 2004. The biggest problem in the EU is the politicians themselves and their lack of accountability and competence , followed by the different cultures and customs of each country and their history . Germany was rebuilt after the war by the allies , and has had no armed forces to pay for since then , and has used cheap labour from Turkey , and used coal for electricity thus polluting . The number of problems in Germany from banks to car makers proves even Germany is not good . The major problem of the EU is its lack of democracy which has been proved time and time agin with the refusal of referendums and politicians saying that they will federalise Europe even though people do not want it . Only countries with equal economies etc should be part of the EU , and this should be open to referendum for its citizens . The EU will probably not work in the long term as there are too many countries with different customs , cultures and economies .It can also be seen that some countries build and maintain their infrastructure , but others like Germany do not maintain them and only think about exports . Very few countries have accepted that they should expect employment to reduce as jobs are automated , and that climate change will create problems of food and water resources , and their populations are unsustainable .